Starting the weekend a little early here! Just like the last free pic weekend, one image goes up each day. So, what’s the subject this time? 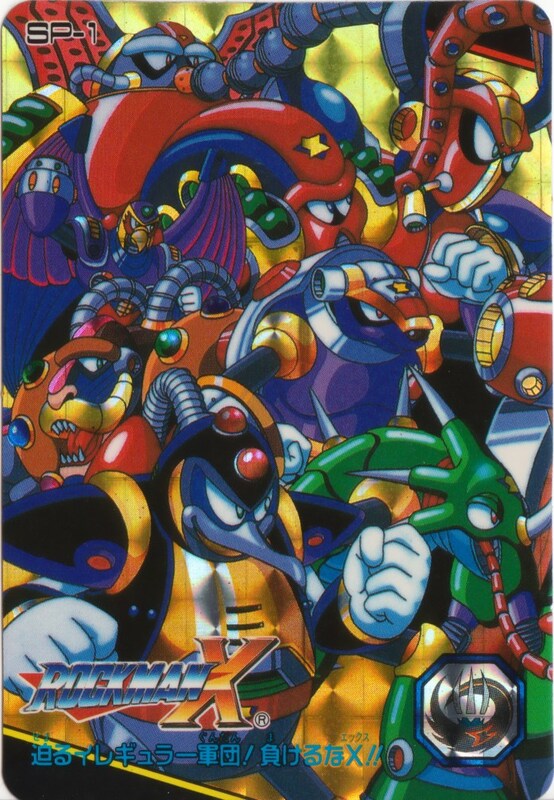 Four Special holofoil Carddas cards from the Rockman X Revival series! Rockman X Revival is basically a re-packaging of the Rockman X and Rockman X2 Carddas line, with 6 extra cards added to the mix. Four of those contained new original artwork, and those are the ones we’ll be looking at this weekend! The Irregular army is closing in! Don’t give in, X!! A collage of the Mavericks from the first X game, but with a claw and cape Irregular holomark based on Sigma’s X2 appearance. The next card in the set will be up tomorrow! 2 Comments to "Free X Pic Weekend part 1"
I was gonna say “now Kuwanger’s giant-sized?” but it looks like they’re ALL on different planes of existence.